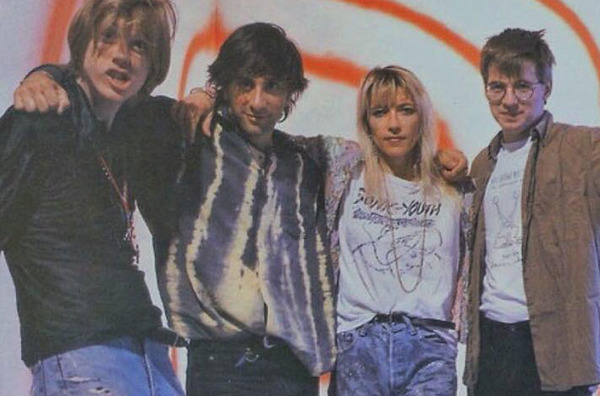 Sonic Youth may be no more, but the band's breakup hasn't stopped the influential indie rockers from revisiting their back catalogue. Following last year's reissued versions of Bad Moon Rising and EVOL, a slew of new reprints are about to arrive. Experimental Jet Set, Trash and No Star (1994), A Thousand Leaves (1998) and NYC Ghosts & Flowers (2000) will each return to wax on January 22 through USM. And if that's not enough good news for fans, vinyl reprints of Murray Street (2002), Sonic Nurse (2004) and Rather Ripped (2006) will follow on February 19. The string of six consecutively released records heard the band move away from the brash grunge-y tendencies of Dirty and Goo, and embracing a more laid-back sound on Experimental Jet Set, Trash and No Star. A Thousand Leaves marked the first album recorded at Sonic Youth's own studio in Lower Manhattan, while NYC Ghosts & Flowers heard the band toying with previously abandoned instruments after a tour theft left them without a number of irreplaceable customized guitars and effects pedals. Murray Street holds significance as the first Sonic Youth record with Jim O'Rourke as an official member, while Sonic Nurse served as his last. Rather Ripped was originally released in 2006, and now stands as the band's penultimate studio album.